How do I upgrade the firmware on my DIR-845L router? How do I upgrade the firmware on my DIR‑845L router? Step 1: Download the latest firmware for your DIR Series router from http://www.dlink.com/support or your local D-Link support website. Step 2: Once you´ve downloaded the firmware, open a web browser such as Internet browser and enter http://dlinkrouter, http://dlinkrouter.local, or http://192.168.0.1 into the address bar. Step 3: The default username is Admin and the password should be left blank. Click Login. 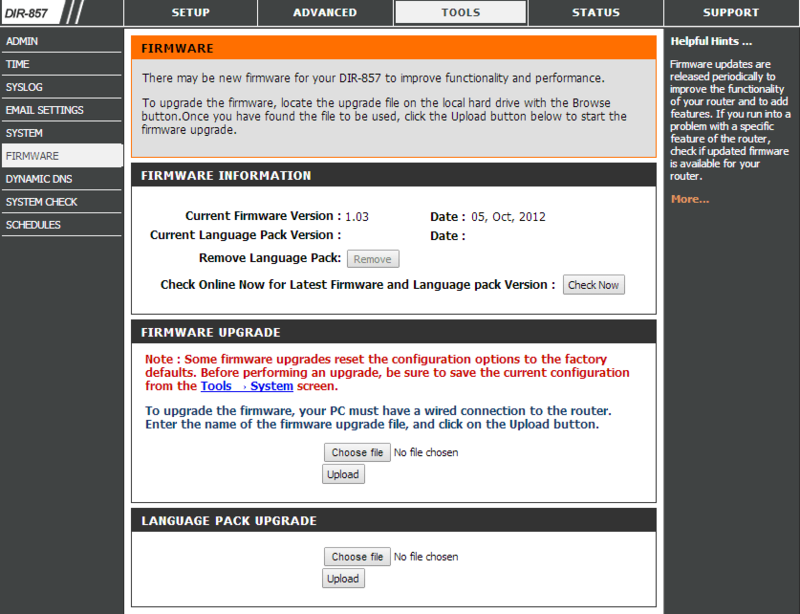 Step 4: Click on the Tools tab on the top and then click on Firmware from the menu on the left-hand side. Under Firmware Upgrade click on the Browse button and locate the .bin file you downloaded in Step 1. Highlight the file by clicking on it once and then click Open. Step 5: Click on Upgrade to upgrade firmware. It may take up to 30 seconds for the upgrade to complete. When the upgrade is complete, a confirmation window will appear, click Con-tinue when it appears. The firmware is now upgraded.